The filmography of School of Education Dean Emeritus Douglas Biklen will be celebrated at the 12th annual Syracuse International Film Festival. 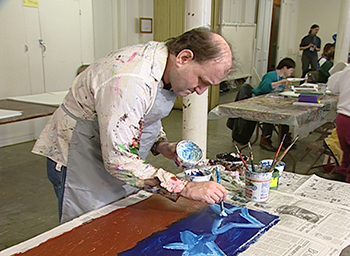 The Doug Biklen Imaging Disability in Film Showcase will be held on Saturday, Oct. 17, 2:30-5 p.m. at the Everson Museum of Art, 401 Harrison St., Syracuse. Larry Bissonnette in a still from “My Classic Life as an Artist.” He is featured in two of the films that will be screened on Oct. 17. Tickets are available online at http://www.filminsyracuse.com, or at the venue 30 minutes prior to the program. The showcase is presented by the School of Education and the David B. Falk College of Sport and Human Dynamics. Biklen is a former member of the film festival’s board of directors, and was instrumental in creating the annual Disability in Film Showcase. Therefore, this year, and in the future, the showcase will carry his name. Biklen was also honored by the festival in 2013 when he was presented with the Sophia Award, an honor reserved for individuals who have made lifelong outstanding contributions to the vibrant world of independent cinema. The Doug Biklen Imaging Disability in Film Showcase will feature clips from three of Biklen’s films: Academy Award –nominated “Autism is a World” (2004), co-produced by Biklen, produced and directed by Gerardine Wurzburg; “My Classic Life as an Artist” (2005), executive produced by Biklen, co-produced and directed by Zach Rossetti G’06 PhD’07; and “Wretches and Jabberers” (2010), co-produced by Biklen, produced and directed by Wurzburg. Biklen will provide commentary on the clips presented. Biklen retired from Syracuse University in January 2014, after eight years as dean of the School of Education and four decades on the faculty. His work focused on the sociology of disability, inclusive education, whole school reform, disability policy and communication. A worldwide lecturer and scholar, Biklen dedicated his academic career to the study of autism and has helped to challenge prevailing views that often accompany the disability. He has published over a dozen books including, “Autism and the Myth of the Person Alone” (NYU Press, 2005) which has been described as “a must for any who understand the autistic experience.” In 2012 he was awarded the UNESCO/Emir Jaber al-Ahmad al-Jaber al-Sabah Prize to promote quality education for persons with intellectual disabilities.